Earlier today, it looked as if A.B. 60 was dead. Now, not only is it alive, but it just passed through the Senate 28 votes to 8. It now needs to pass through the California Assembly before midnight or we might not get a chance to pass it until next year. A.B. 60 is a bill that would give everyone in California the opportunity to drive without fear of being pulled over and deported. It could affect over a million undocumented immigrants. It will help send a strong message to the nation that undocumented people are a part of our communities, and it will also make all of us safer by ensuring everyone on the road is licensed. Please CALL and SHARE this to make sure A.B. 60 gets passed before midnight. If it passes or you read this after midnight, Sept. 13, please still CALL to let your Assembly Member know you care about this and to get updates on next steps. I'm calling to support the passage of A.B. 60 so that everyone in California can have the opportunity to drive without fear of being pulled over and deported. Not only will A.B. 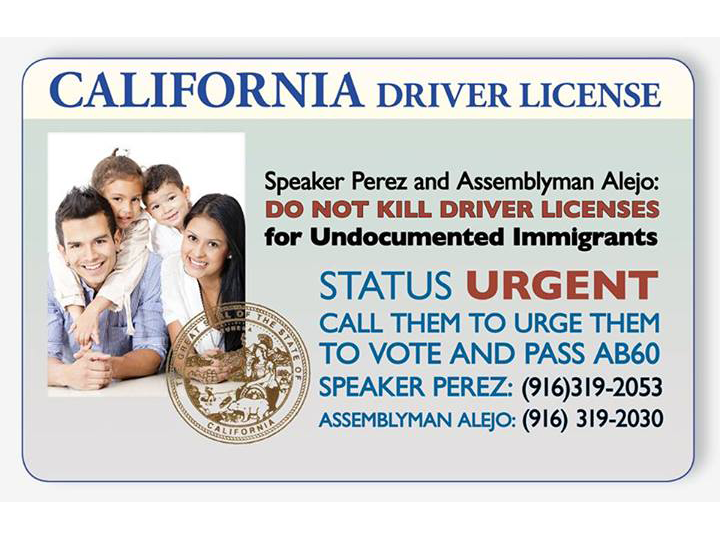 60 help the economy and send a strong message to the nation that undocumented people are a part of our communities and here to stay, it will make all of us safer by making sure everyone on the road is licensed.